Leonardo da Vinci captured the moment in which Jesus makes the staggering announcement that he will be betrayed by one of His disciples. This is the last supper they will share. He is indeed betrayed by Judas Iscariot that same night. He is crucified by Pontius Pilate. He rises from the dead three days later. 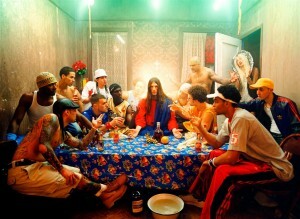 Artists have expressed their own versions of The Last Supper for over 500 years. Their interpretations are profound, enlightened, mysterious, and humorous. 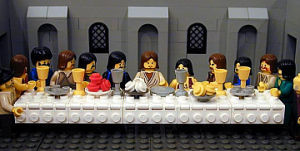 You won’t believe the tumultuous life of The Last Supper! Kirby! I love this one! I’ve never seen any of the other paintings. And the info was new too. You are doing such a good job. I loved the blog, Kirby. 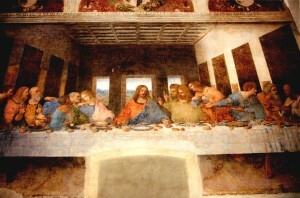 It is interesting to learn about the history of The Last Supper and to learn about how other artists depicted it. At this Easter time of year it is very fitting to learn about it. The Last Supper did indeed change the world. Thanks for your interesting blogs. I am learning so much! I so enjoyed the collected “The Last Supper” pieces you picked for your timely blog representing ridiculous to the sublime and each with its own charm nonetheless. Legos? Perhaps my second favorite. Bravo, Kirby! Wonderful and informative paintings and video. It struck me that my visual of the last supper is always this painting and is held up by all the follwing interpretations. It made me wonder how the real last supper appeared. Thank yo as always. Hi, Kirby. I wish I could come up with as much creativity with my words as you do with yours. I actually mean creativity to say “thank you” in a more resounding way! 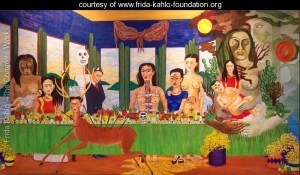 Frida’s Last Supper is my favorite, because for me it really captures the feeling of connection and the coheseive strength of a group. Since there was one in DaVinci’s group who wasn’t there in true committment, I wonder if Frida’s includes one too? 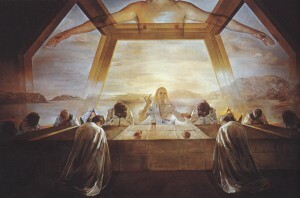 The iLastSupper shows what an iconic shape the painting has become. Guess that’s my second favorite. Grazie. While visiting Milano, was fortunate to view and listen to the docent’s history and artistic view of this creation by the genius of Leonardo. Milano was heavily bombed during WW II. The church containing this master piece was largely destroyed. However, Da Vinci work remained basically untouched. Saved from destruction by chance?